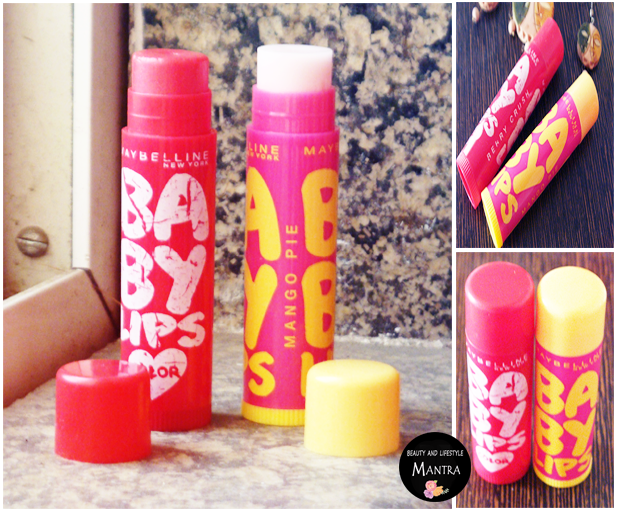 Today, Mybelline has created lots of Baby Lips Lip Balm range.Lip Balm are a must have in any girl’s vanity kit. I always keep lip balm in my handbag and I never leave home without it. Lip balm is a very important beauty product in my daily life. I always preferred lip balm as a primer. Its moisturize my lip too. I’ve been a long time fan of the Nivea Fruity Shine tinted lip balms but now a days, the Maybelline Baby lips Color Balms have all my love! I picked up Berry Crush few months back and more recently, Mango Pie. First of all, I was really impressed by the packaging. And when I tried Baby lips on I really loved it; the texture, the smell, everything. The price of these lip balms vary as these are available in two varieties. The colorless one (Mango Pie) is priced at 125 INR while the tinted version (Berry Crush) is priced at 150 INR for 4 gm of product. Berry Crush : This is my first lip balm from Maybelline baby lips bright collection. The lip balm is a tinted one and gives a nice rosy pink tint. It keeps your lips hydrated for almost 4-5 hours which is great. The fragrance is really nice which give out fresh smell of berry and does not feel artificial. It also has SPF 16 which is definitely a bonus. Texture is so fine and smooth. It keeps my lips moisturized for quite a decent time and also protects from sun. And, I absolutely love the berry crush. It gives my lips a very subtle tint and moisturizes equally well. Mango Pie : Mango Pie is just like a regular lip balm with no tint. The moment you open the lip balm, you can experience the fragrance of fresh ripe mangoes. If you are a mango lover, then you will enjoy it. Mango pie is a colorless lip balm which has creamy buttery texture. It doesn't make the lips greasy at all. If you have chapped and dry lips problem, then apply it twice daily. I also like that they have SPF 20. Texture is very smooth, and doesn't feel waxy or heavy or sticky. These days, I am a die heart fan of Maybelline Baby Lips Lip Balms! These are fun looking cute balms, which do work wonders. They are very moisturizing. In fact They have even repaired my dry lips. They don’t feel heavy on lips,they are very light. My personal favorite is Berry Crush since it gives the a lovely natural pink tint to my lips! I will definitely recommend.